'Are we going to Abu Dhaaaaabi tomorrow?' Maryam asked in her sing song voice. Those that know her will know what I mean when I say her sing song voice. Akber gave me that look- the one questioning me why I tell her these plans so early. We both knew the consequences. That is all she asked the whole day, every hour! Not only did she wake when the first flitter of morning sun seeped past her blinds the next day, she was ready to leave by 7am. Yes, that is right. And so, at a more respectable 10am, both kids were packed into the car and one picnic basket of snacks that Akber remarked could feed an army in the desert. 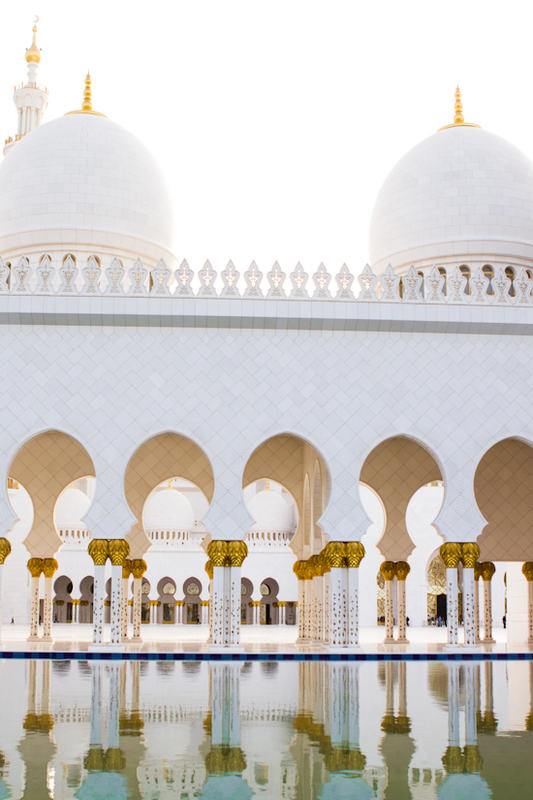 I had been meaning to visit the Grand Mosque (or Sheikh Zayed Mosque) ever since I arrived as a tourist in Dubai more than five years ago. One failed attempt two years ago occurred when the imposing structure was within arm's reach but the spaghetti off roads surrounding the mosque meant it still remained elusive. Not this time though. We carefully planned our route. Akber had some work in town so it was about 4:30 or so when we reached. Perfect time for a sunset tour of the mosque and the best time to take photos. Although still very hot, the mosque was bathed in a golden aura. 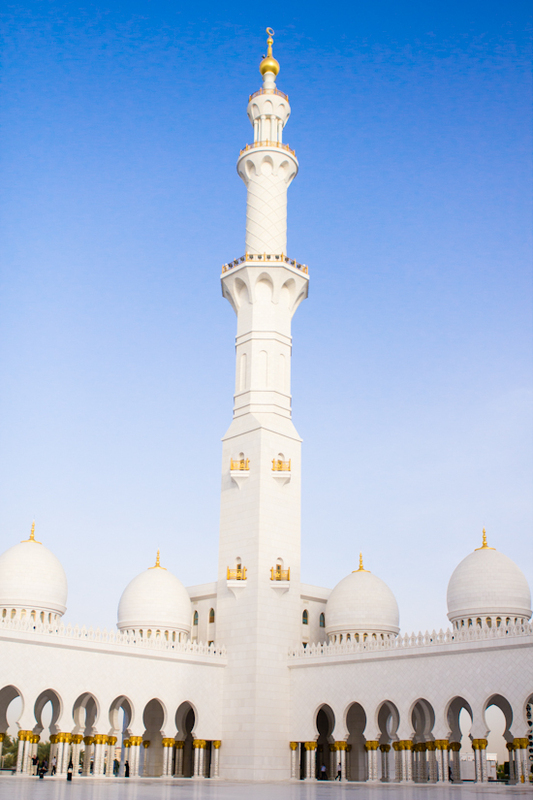 Through the heat, it looked as though the numerous minarets were dancing. As my feet burrowed into the plush, plump carpets, I was taken in by the light and colors. The light that bounced off the shimmering chandeliers, the light that was reflected off of the jeweled scriptures, that amazing, dreamy light. It took my breath away. At every step, there was a sight to inspire, rows and rows upon rows of gilded columns, enchanting calligraphy, stories behind every corner. I had many questions that our guide automatically knew the answer to without hesitation. As I sat near one of the many reflective pools, I took in all the beauty, the peace and calming atmosphere. Around me, I saw faces of every culture, every color, every age all gathered as equals. Beautiful. I highly recommend you to visit this marvelous structure if you are in UAE. And this drink? Well, after a long and hot day taking photographs at every opportunity, this is exactly the kind of cooling drink I needed. We all needed actually. 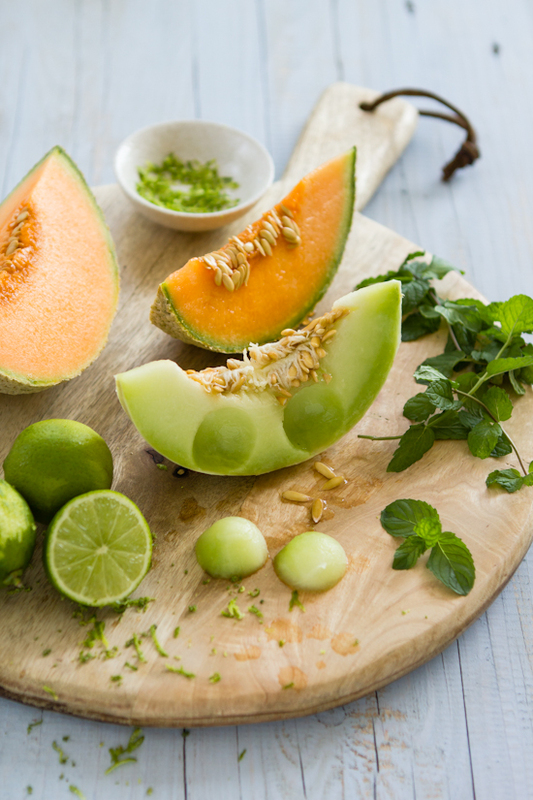 It is a forgiving recipe- all the ingredients can be varied according to your taste. The best part is- we have had it as a slushy, a popsicle, a sorbet, a granita. Same recipe, many ways to enjoy it. I hope you will give it a try in some form before summer slips away. Ramadhan Kareem everyone. To make the sugar syrup, boil water and sugar until the sugar has just dissolved. 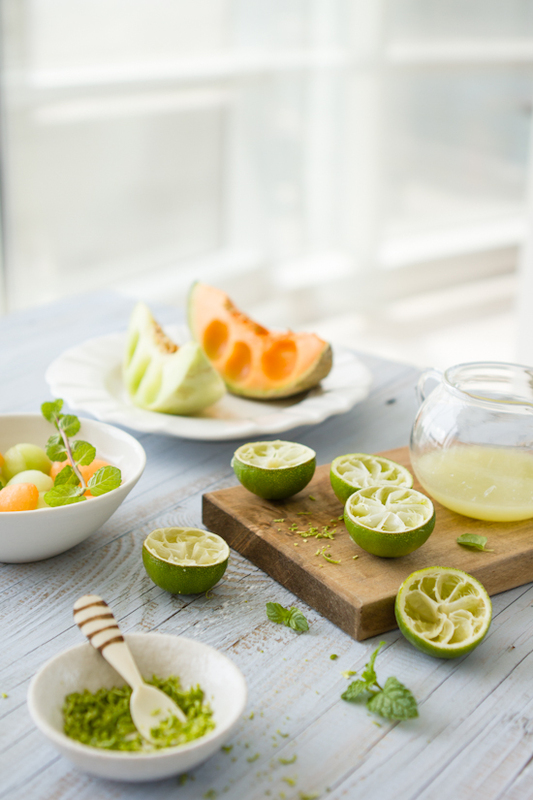 Depending on the sweetness of the melons, you will not use up all the sugar syrup which can be frozen as ice cubes to use some other time. To make the slushy, blend all the ingredients at high speed in a blender. Pour into glasses and serve immediately. A delightful slushy and gorgeous pictures! This mosque is beautiful. Amazing post, Sukaina! 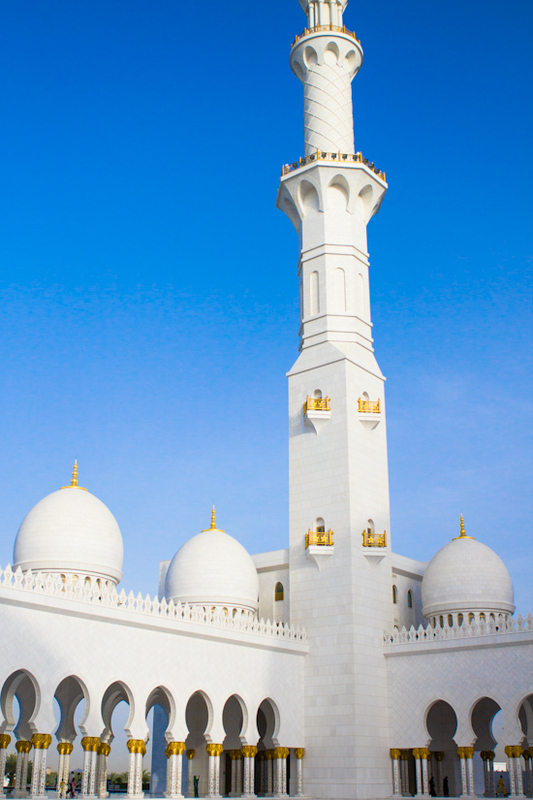 I have been to the mosque when I visited Dubai. It's a beautiful place! Absolutely beautiful....the photography is a perfect complement to your refreshing drink. I know how hot it must be there because it is probably equally hot down here in TX. Did you know that the largest mosque in the U.S. is here in Houston? We took a tour of it last month. It is amazing...quite similar to the one in your photos. Thank you for braving the heat and the photo tour! Thos slushies look so refreshing Sukiana. I wish it wasn't so cold here so I could enjoy one. The mosque is so amazingly beautiful. I've not seen anything like it. I'm totally digging this slushy! It's been so hot and humid out, this would really hit the spot! Love the travel shots too! Stunning! Ramadan Kareem. 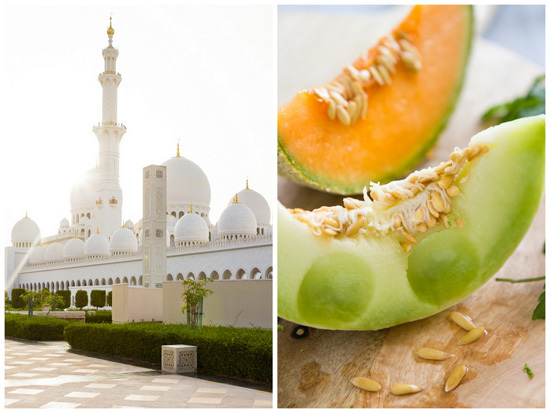 What a beautiful mosque and refreshing juice! I've got to plan a visit to Dubai one day. oh, this is so amazing. wonderful pictures and such a fantastic architecture full of light. ramadhan kareem to u and family..breathtaking pics of the mosque and the slush..
What a lovely sight that mosque is. I am so looking forward to the trip in October so I can see it in all its glory too. Your images makes me want to get there today! 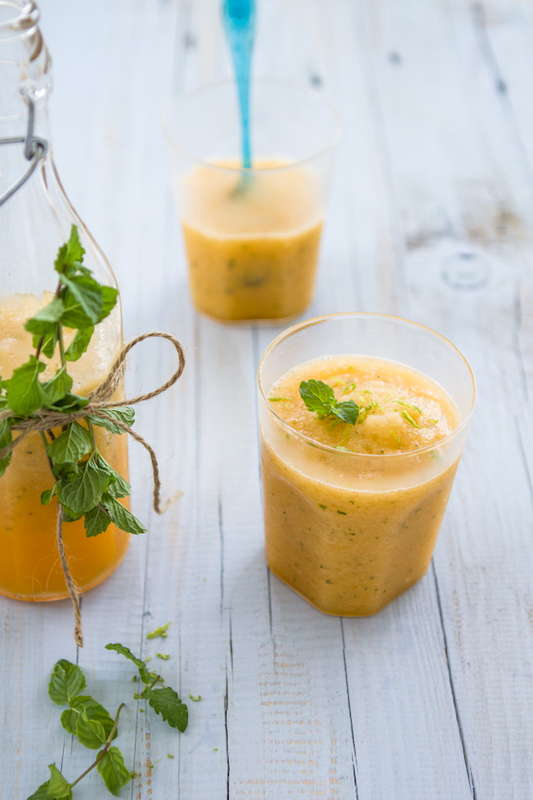 Not only does this slushy look delicious and refreshing, you truly have a gift behind the lense. Your photography skills are something I truly envy! This looks absolutely perfect for summer. I've just got back from Italy where we ate melon granita with a hint of chilli - frozen melon is just so good! 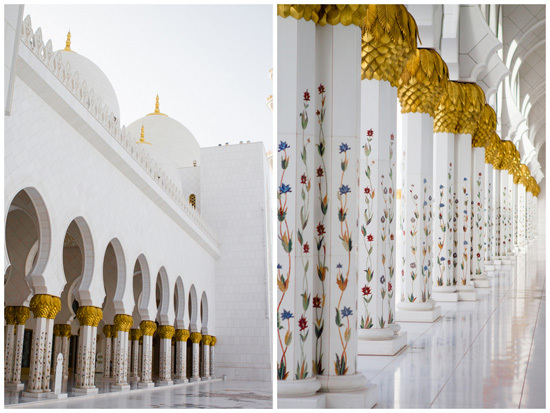 Absolutely stunning shots of the Mosque. 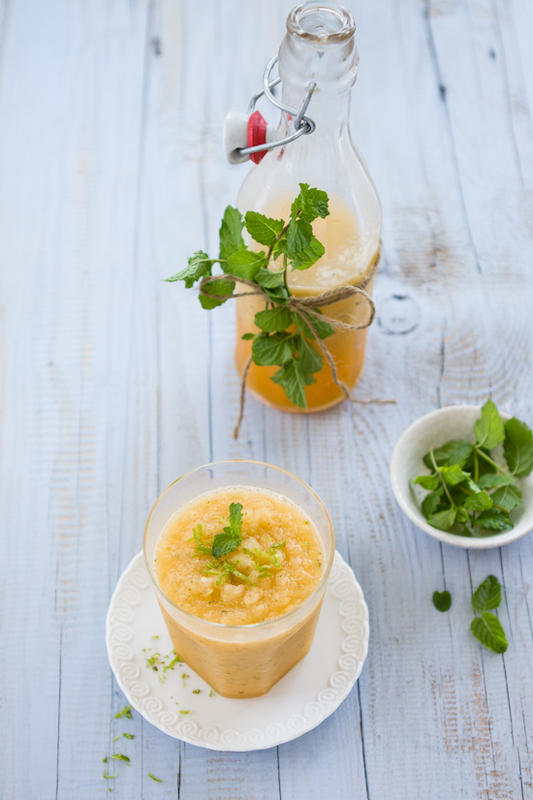 The drink looks so summery and refreshing! 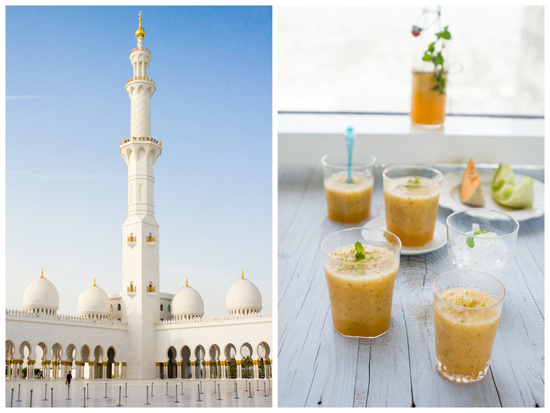 The drink and photos of the Mosque go with each other.. Your shots are so beautifully styled and so creative!! Sukaina, I am in awe. 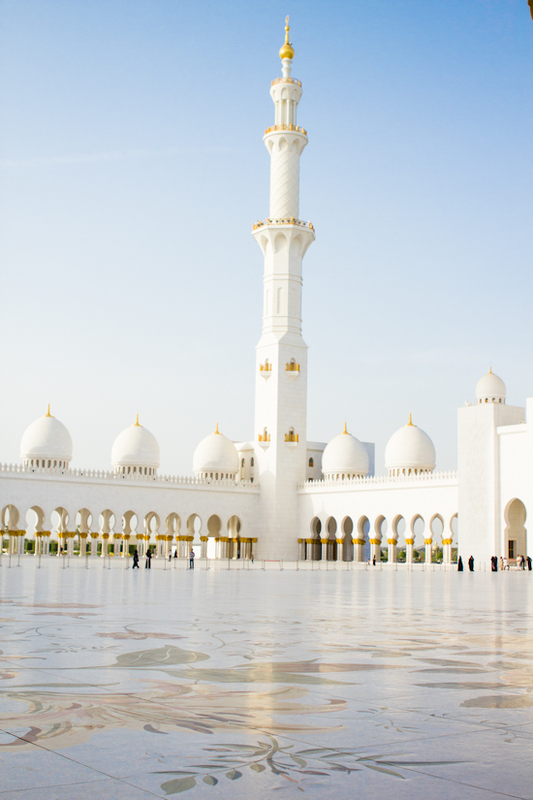 I will never forget how my mother's sister returned from her first visit to Abu Dhabi and the Mosque. I can finally have some appreciation for the grandeur and beauty, but my goodness, how I hope to visit myself one day. I love the way you captured it and integrated your gorgeous photos of the slushy. Stunning. Beautifully stunning. I can see why your whole family, especially your little one was so looking foward to go. It's breathtaking. 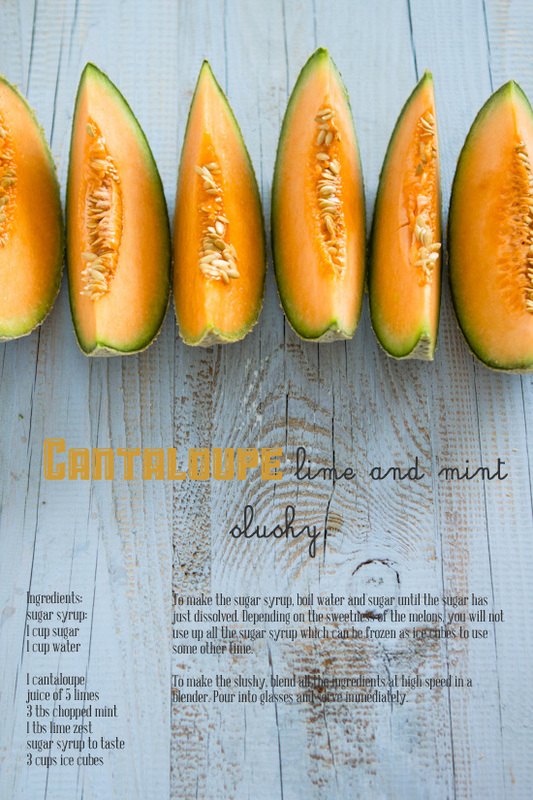 Of course the cantaloupe slushy looks quite beautiful and delicious too. WOW. 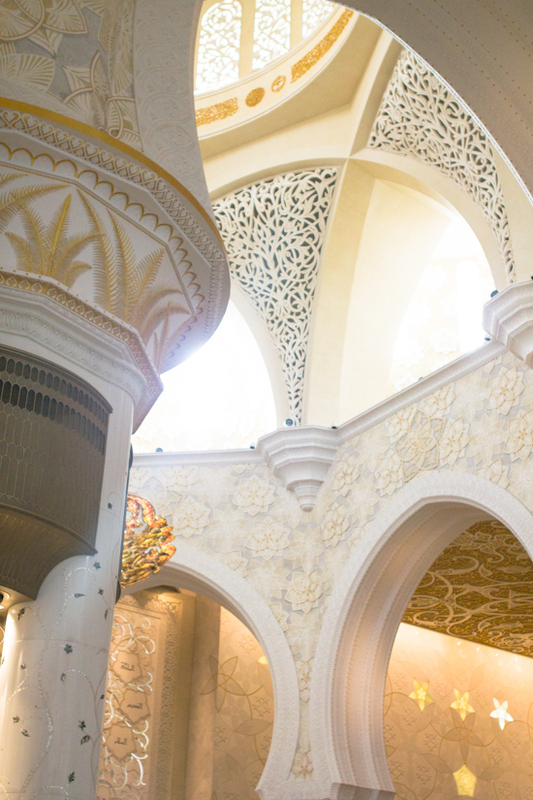 The architecture is absolutely breathtaking! I would love to visit Dubai some time in the near future. 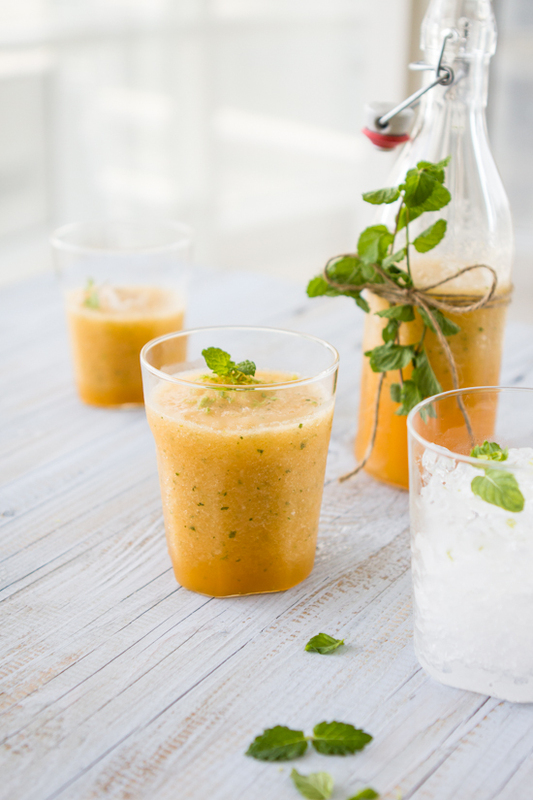 Your slushy recipe looks so fruity and refreshing. I like that you can enjoy the same frozen dessert recipe in many different forms. 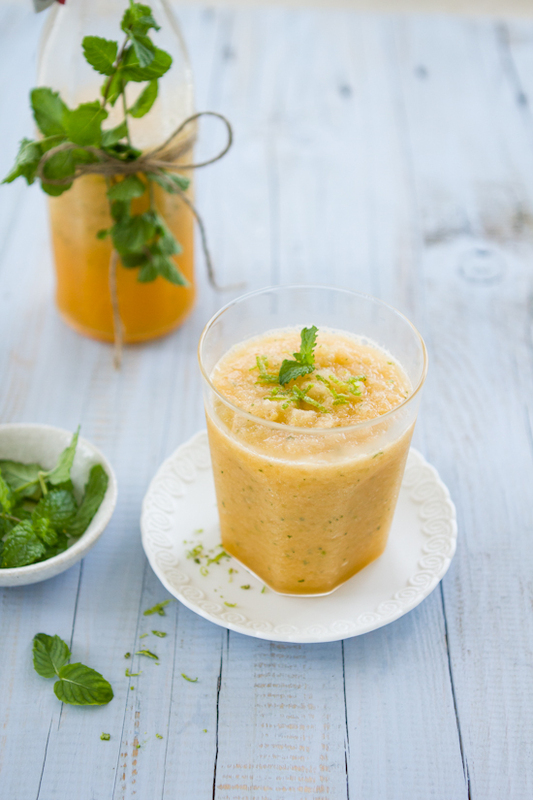 I didn't have mint leaves with me so I made this with cantaloupes, sugar, lime juice, ice and some green "khus" sherbat... Amazingly refreshing! Beautiful colors and recipe ! Become a professional sales executive and distribution manager by pursuing high-quality SAP SD certification training course from talent magnifier. Take a demo class free in Talent Magnifier. We are here to provide the service related to the Arlo camera for more information you can visit our site. We are here to give the service related to the Arlo camera around the world if you need any kind of issues or problem in your Arlo camera then you can go to our site. You can contact AOL Support team to get help related to AOL Sign up. If you don’t know how to sign up in AOL mail or how to create a new AOL account then contact our technical support team to resolve all issues.